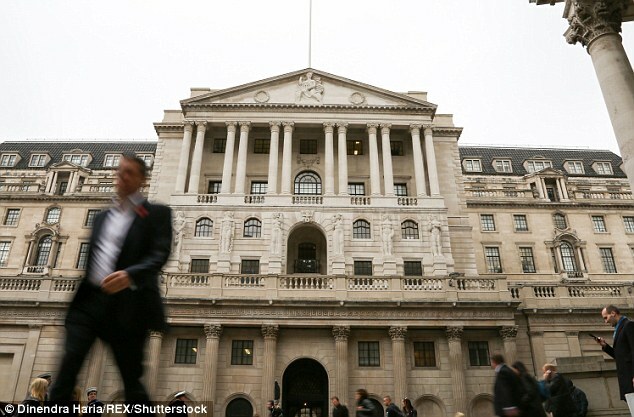 Millions of long-suffering savers have missed out on a rise in Bank of England interest rates as lenders pocket the profits instead. The Bank increased the base rate by 0.25 percentage points last month, but the average easy access account only pays a paltry 0.06 points extra in interest. It leaves the big lenders open to the accusation that they are keeping the difference for themselves. Campaigners last night accused the banks responsible of betraying their customers, and demanded they do more for prudent families. Anna Bowes of Savings Champion said: ‘The High Street banks where the majority of people hold their money have been really, really dreadful in terms of passing rate rises on. ‘People just need to take a leap away from their High Street provider, because they’re treating savers really badly. 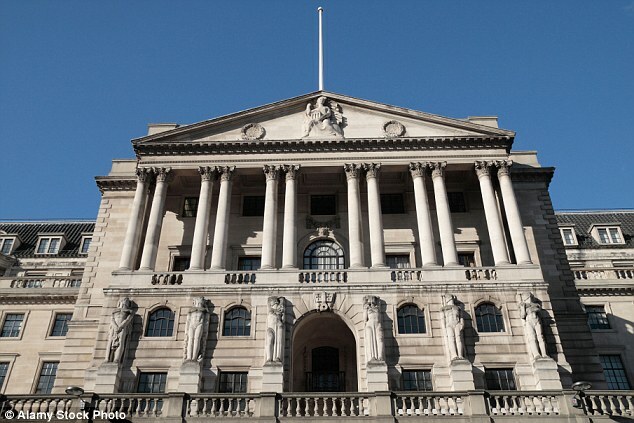 Higher Bank of England rates increase the interest that borrowers must pay on their loans, boosting the amount earned by the banks. The banks could pass this money on in full to savers by hiking the interest rates they earn on their nest eggs. But instead, many lenders are pocketing some or all of the extra cash – meaning it is likely to go to shareholders in dividends, or giving staff higher bonuses. The worst offender listed by Moneyfacts is Lloyds, which has not increased its Easy Saver account for new customers at all since the rate rise at the start of last month. This account pays interest of just 0.2 per cent, meaning customers’ deposits are actually losing value as they fail to keep pace with rising prices. 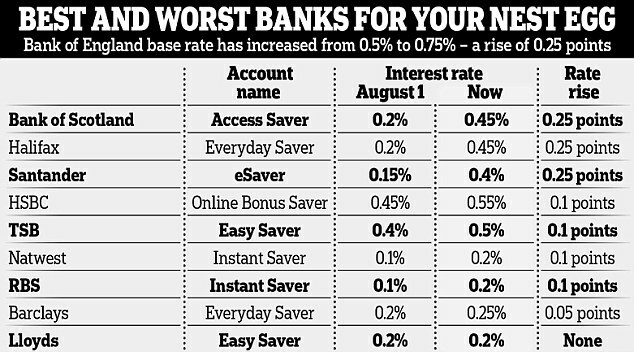 Barclays was next worst, with a rate hike of only 0.05 points to its Everyday Saver account, which now pays 0.25 per cent. The average easy access rate has increased by only 0.06 per cent since the start of August, and today stands at just 0.59 per cent. This is significantly below the Bank of England’s new 0.75 per cent base rate. Tens of thousands of TSB customers were yesterday unable to log into their online accounts or make payments after the bank was hit by yet another IT disaster. In some cases direct debits were taken out twice. In April many customers were left unable to access their account for more than a month.